Who Are The Alfan Foundation? We recently met The Alfan Foundation through our local networking group, The Oxfordshire Project. They are a wonderful non-profit making organisation that are focused on helping to improve the welfare of children in need in Ghana. Having seen how desperately in need they were for items such as toys, clothes, shoes, and basic school equipment such as books, pens and pencils, they decided to help by organising and sending regular shipments of these items to schools and orphanages in Ghana to help the children in their upbringing and education. Their donations often come from businesses who have surplus stationery supplies laying around that aren’t used – think of all those pens you are often gifted at conferences and networking events! Founders Annie and Alfons are able use these donations to create valuable teacher packs to distribute to the schools who really need them. Upon further discussions with Annie and Alfons we learnt that they were also fundraising for the building of computer labs at the schools and that they also were looking donations of computer equipment to fill these. Suddenly we realised there was a much better home for our old equipment than in our store cupboard! We were delighted to have the chance to donate a collection of our older laptops, monitors, mice and keyboards to such worthy cause. All of which are being wiped, packaged, ready to be sent to Ghana next month! Whilst the laptops may not be lightning fast or the newest model, they can make a real difference for those less privileged than us. We’re proud to be able support a local charity like The Alfan Foundation. 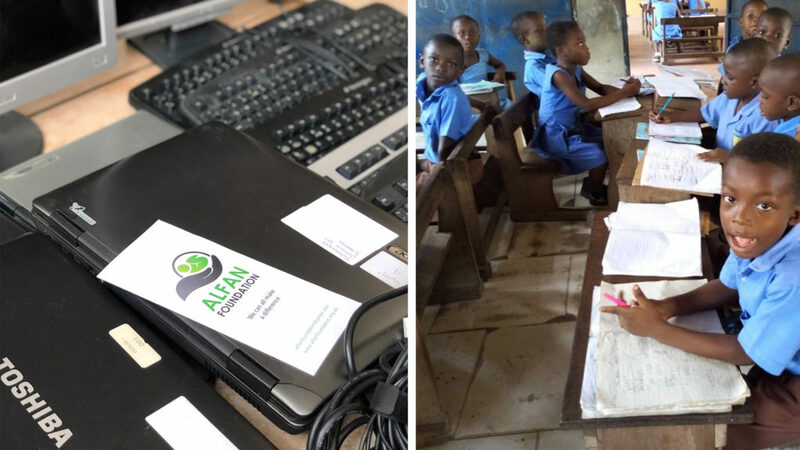 Like any charity Alfan Foundation relies donations like these, so we would like to ask if you have any spare stationary, or computer equipment you no longer need, consider donating to The Alfan Foundation today. For more information visit http://alfanfoundation.org.uk and make a difference.